On Spacehive we have almost two million pounds in funding from our partners across the country, including everyone from the Mayor of London to Manchester City Council and Growing a Greener Britain to Better Communities. So whether you’re crowdfunding an arts project in Hull, a sports tournament in York or a green space in Manchester – we have funding to help you make it happen. Explore the funds from our partners here. The big question is, how can you access all these different funds? Easy! Just follow our seven steps below. 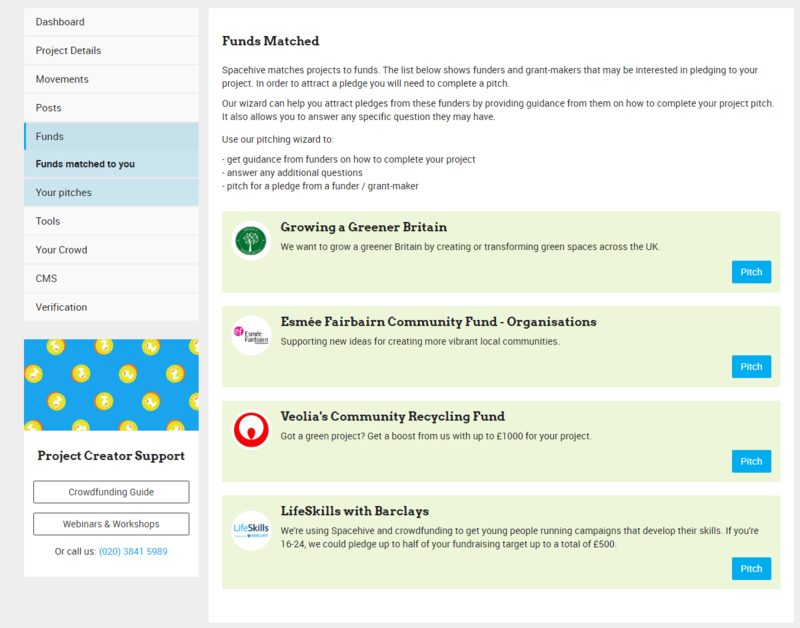 Simply click ‘Create‘ to add your project to Spacehive. Not sure if your project is suitable? Check our eligibility criteria here. If you’re creating your project as part of a group, charity, council or business, make sure you sign up as an organisation. This is essential as some funds will only back projects created by certain organisation types – charities, community groups etc. If you’ve created your project as an individual rather than an organisation by mistake simply message the team at support@spacehive.com and they’ll help sort you out. Important! You must fill in all of your project information before you can see the funds you’ve matched to and pitch to them. Funds match with projects on four key areas – who the people behind the project are, where they are, what impact they’ll have and what type of project they are. Project categories include Sport & Play, Parks & Gardens, Arts & Culture, Buildings, Food & Farming and Streets & Infrastructure. Choose one category (or two if needed) that reflects your project type. Your project will have an effect on the area around it – whether it’s helping the environment, promoting activity, creating jobs or volunteer opportunities or perhaps boosting the local economy. Select all of the impact areas relevant to your project as it will help you match with suitable funds. Show us where your project will be by drawing the area around it on the map. Then continue to fill in the rest of your project information – from the description and imagery to permissions and costs. Remember our funding partners will be looking at all of this information when they receive your pitch. Once you’ve submitted your costs and pressed ‘Save and Finish’ you’ll be able to access the Funds tab. Voilà! And just like that all of the funds that have matched to your project will be revealed. Important! You must pitch to any funds you’re interested in before submitting for verification. Gone too far? 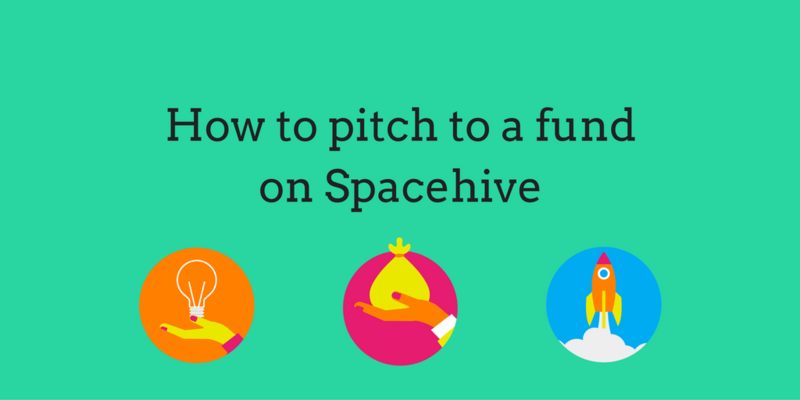 No worries, simply message our team on support@spacehive.com and they will help you make your pitch. To attract a pledge, you need to complete a pitch. Follow the instructions and guidance provided by each fund to complete your project pitch. The best part? Complete one pitch and all of your answers will then save, ready for you to complete the next one quickly and easily. Once you’ve completed all of the pitches you would like to submit, it’s time to get verified and start your crowdfund campaign. If you are successful in your pitch, the fund will pledge to your project. Woo! If you haven’t been selected, they’ll be in touch to let you know. Some pledges may come with terms and conditions, which you can choose whether or not to accept before receiving their pledge. The power of crowdfunding lies in bringing individuals, organisations, businesses and councils together to make local places better. When deciding who to pledge to, funders are looking for evidence of community engagement and backing. Discover the secrets of running a successful crowdfunding campaign by joining us for a webinar or a workshop near you. Check out the latest events here. Ready to get started? Add your project here.